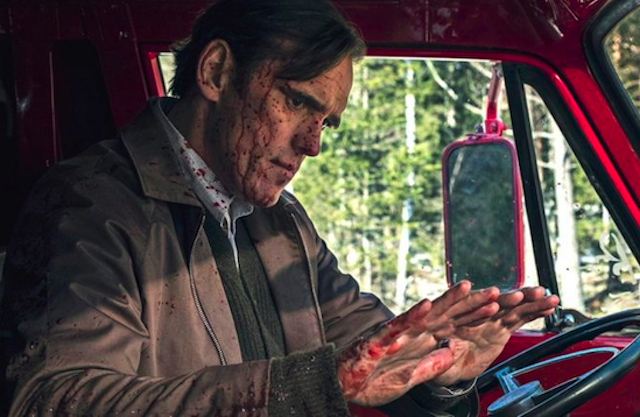 It features veteran actor Matt Dillon in full character mode as the serial killer, icily going from “incident” to incident (the killings) over a 12 year period in the 1970s and ‘80s. The planning and execution of each incident gets more and more detailed, until it becomes almost intentionally undoable. The killer’s madness is almost secondary to his destiny, and the blithe way he goes about the kills becomes as bizarre as the understanding that there is no “protection” in life, only a series of lucky survival that determines whether we’re done in by external forces or later by inner tissue breakdown. It could make you walk out (I did twice to take a break), and it will make you think. How you want to take it all in will be a self determination, just as life is. The film begins with Jack (Matt Dillon) picking up a woman (Uma Thurman) on the road whose car has a flat she can’t fix. On their way to a service station, the conversation turns to how she, as a stranger, might possible be in the car of a killer. The speculation is obviously affecting Jack, who eventually kills her in a shocking way, revealing that he is indeed a serial killer. This is the “1st Incident” of five in the film, each becoming more and more horrible (again, as if he wants to get caught). As a handsome guy and smooth talker, he is able to bring a single mother (Sofie Grabol) and her sons towards an eventual “incident” (3rd) and sweet talk a another woman (Riley Keough) into another specific killing (4th). It concludes near his capture, which unfortunately couldn’t come soon enough for the “house” he has created. I have to, right off the bat, give Matt Dillon some credit… I’ve grown up with him, experiencing his evolution as an actor through the years. I applaud the fearlessness in which he approaches the character, and the performance wisdom in using his natural charms. He is stone cold in all of these incidences, except for the character’s Obsessive Compulsive Disorder, and even that he is able to channel to an almost comic effect. Dillon was willing to go the distance. Lars von Trier, however, is also willing to go too far, and the criticism of misogyny will continue to haunt him with this film. He doesn’t mind lingering on vivid torture scenes involving women, especially with the 2nd Incident (a strangulation) and the aforementioned 3rd, which involved the mother and her children. There is some real cruelty on display, punctuated by the 4th (Riley Keough, Elvis’ grand-daughter for chrissakes) as the Dillon character psychologically tortures her by continually calling her “Simple.” At least von Trier chose to do the incident off screen (first showing a prolonged psyche torture), but also he couldn’t help but expose the after effects. I don’t like extreme violence of any kind on screen, and the industry often paints a picture of heroism for stone cold killers, that I believe can create problems for those with mental states who have a hard time discerning fantasy and reality. In a sense, von Trier is reflecting the ever-coarsening society, where the rights of weapon owners are more valuable than the people who die as a result of those rights. With a means to an end, a killer just needs to be perched in a Vegas hotel room or walking through the door of a school to get their notoriety. Why shouldn’t art reflect those “incidences”? With the conclusion of this film, which refers to afterlife literature, the final result is “the comeuppance,” I suppose. It’s hard to recommend this film, I rank it on a five point scale, and for me the value came out to three and a half. But really, sensitive folks don’t need this experience in their lives, and only philosophers might embrace it. When the thought process ponders good and evil, today it’s a very very thin line.